Sometime last year, the government released the iDOLE OFW card, which OFWs can use to avail of various government benefits. Unfortunately, there were tons of issues such as confusing guidelines and the photo of President Duterte in the card. The government decided to change that and issue a new OFW card – the OFW e-Card. The OFW e-Card is the new card issued to OFWs. It serves as a proof of membership to OWWA as well as an Overseas Employment Certificate (OEC) for legitimate OFWs. To avail of OWWA benefits, all you need to do is to present the card at OWWA Regional Welfare Office, POEA, Philippine Overseas Labor Office (POLO). Department of Foreign Affairs, Bureau of Immigration, and the Philippine Embassy in your respective employment country among others. Why should you get an OFW e-Card? Comes with security features like QR code and unique OFW membership number for proper verification. This also prevents data breach as well. The best part is unlike the iDOLE OFW Card, the e-Card application is easy since physical documents are no longer required. There is also now an OWWA mobile app so you can easily keep track of your information. In other words, a Balik Manggagawa may apply for OFW e-Card. Per POEA, a Balik-Manggagawa is an OFW who has completed or is completing his or her employment contract and has an intention to return to the same employer, regardless of the job site. 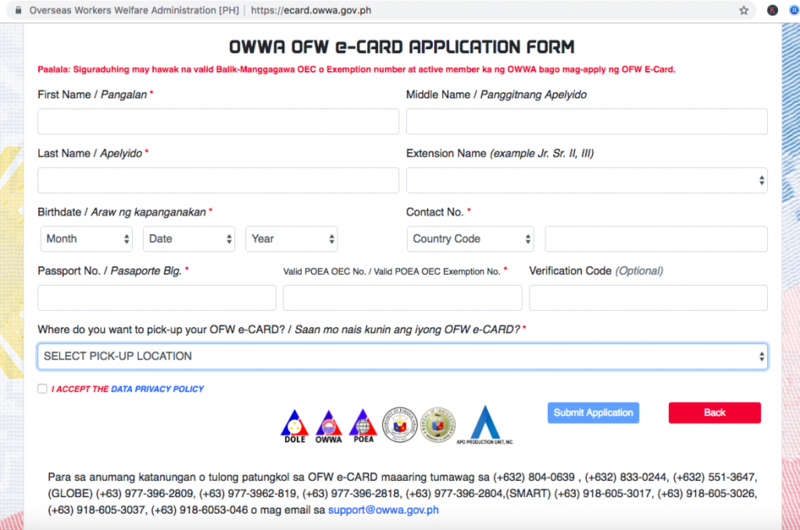 Visit the OFW e-Card application form site from the OWWA website. You can also click this link to load the online application form. Choose the OWWA Regional Office where you plan to pick up your card. At this point, a Confirmation page will appear. Make sure you take a screenshot or list the tracking number. The tracking number will be used to check the status of the card. Don’t forget to input your email address or Facebook profile name for the status of your card. Use this link (Delivery Status page) to track the status of your card. Once the card is ready for pickup, claim your e-Card at the place you designated. Take note that OFW e-Card is FREE of charge. You can also apply for one even while you’re abroad. Apparently, you can only claim this in the Philippines, which means you can get this while on vacation or assign someone to get it for you. If you want someone to claim the card on your behalf, make sure your representative will submit original Authorization Letter with your signature and a photocopy of your passport. There are also OWWA and POEA Assistance Desks in the airport to help you address e-Card issues. What are you waiting for? Get your OFW e-Card ID now.